you could alternatively highlight it by adding skull white to the imperial purple colour, but you get a very different effect by using the colours I have listed above. If you want to make your dark elf army look different than the majority of DE armies, you can change the colour combination above with other colours. If you want a very stark highlight on the top of this combination, I suggest painting a final highlight of lightning blue in very thin streaks across the miniature. This is not necessary but makes a very eye-catching effect (similar to the tentacle pink on the standard purple scheme). As on the other schemes, you could continue and highlight up to bad moon yellow through bilious green for the same eye-catching effect. Of course there are more combinations than this (dark red, light blue etc.) but these are the ones that I’ve tried and come to like the most. 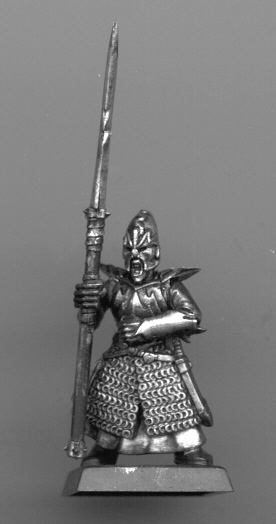 I have not yet tried them on Dark elves, but on other dark and sinister miniatures. So I can imagine the look they will give the dark elf figures. You need the skull white for his teeth. This scheme makes a very bright wooden colour. You could change these colours with the ones used for the leather to make a darker wood. If you do that you should use these colours for the leather, as you still want that great contrast between the leather and the wood. Although leprous brown may be closer to vermin brown than vomit brown, you should use vomit brown because the pigment in leprous brown is way too weak (similar to golden yellow). I suppose that you know how to do this. I sprayed the dark elf in this guide with Citadel Chaos Black undercoat spray. You can paint it black with a brush too, but for large regiments like the dark elf multipart kits it’s less time-consuming to spray them. For tips on how to undercoat with a spray; look at the little leaflet that’s glued on the side of the spray can. Drybrush all the metal areas with chainmail. You could divide this step into two steps first drybrushing with boltgun metal, then mithril silver – the look stays almost the same though. I did it this way. Thin down black ink with a little water and apply it over all the metal areas of the miniature. I just recently figured out that the GW black ink looks better over metal than regular thinned down black paint – because it gives an oily finish to the metal instead of a dry one. Paint all the clothing areas with imperial purple. This will be the deepest shadow colour. When the clothing is done, this will look very different from what you can see now. At these early steps of the miniature you can be a little sloppy. The only things that matter are that you cover the area that you are painting completely, and that you don’t get paint on the other finished areas. Paint liche purple as the first highlight colour, only leaving the very deepest recesses and the outlines imperial purple. Between step 2 and 3, I highlighted with two different mixes of liche purple and warlock purple to get a smoother effect than what you get by painting warlock purple directly on top of the liche purple. Paint pure warlock purple as the next highlight. Now the purple starts to look like sumfin’! You could really leave the purple as it is now. Highlight the outermost edges with tentacle pink. Once again I smoothed it out by highlighting with some mixes of warlock purple and tentacle pink. Basecoat all the skin areas with dwarf flesh. Since this step is so easy I will not show you a picture of how to do it. Wash the flesh areas with pure flesh wash.
From the picture you can also see what areas of flesh this miniature has. When using inks, be sure to apply enough, if you don’t use enough ink on the miniature it will not look shaded at all. You should neither apply too much ink as this will clog the models details. It will also make the entire area blotchy and very dark. Reapply Dwarf flesh to all the raised areas of the skin leaving only the deepest recesses dark. It is very important that you leave the spaces between the fingers dark. Highlight with elf flesh. You should leave some of the areas with dwarf flesh alone, and paint only the outer edges of the skin areas. I suggest that you paint his teeth now too. Just pick them out with a small brush with skull white. You could highlight the skin further by adding small amounts of skull white to elf flesh. But these are just your standard rank and file troops, so I don’t think it is necessary to spend that much time on every one of them. The only wooden part on this miniature is the spear handle. Paint it Snakebite leather. Outline the snakebite leather with brown ink. Outlining is to paint the lines where the different colours meet. I.e. the skin and armour, and the skin and clothing etc. On this miniature it was not necessary to outline the skin because you had already applied a good coat of flesh wash. The flesh wash worked just perfectly as an outline (combined with the black ink of the armour). Paint thin, slightly waving lines of bubonic brown downwards on the wood. We use this technique to imitate wood grain on smooth surfaces. You don’t have to use this technique, but it does look a lot more impressive than simple highlighting techniques. Paint even thinner lines of bleached bone inside the bubonic brown lines. You could skip step 3, but it looks much smoother if you paint Bubonic brown too. Paint all the leather areas with a basecoat of scorched brown. As with the imperial purple, this will be the darkest shade. Highlight the leather areas with Dark flesh. Highlight the very outermost edges with vomit brown. Don’t overdo this stage. 1. Paint the areas that you want gold with Shining gold. The areas I’ve picked is as follows: The trim and decoration on his helmet, the sword guard, the trim around the gem on his belt, the middle layer of plates on his armour and the two small moons hanging from the leather strap from his belt. 2. Outline the armour plates with Flesh Wash (the new one). 3. Highlight the edges of all the golden pieces with burnished gold. This gem was so small that I didn’t use more steps than what I said above. Finished Miniature without the shield and basing. My friend chose the dragon icon for the regiment that this miniature is a part of. Highlight with an equal mix of Sunburst Yellow and Blood Red. Highlight with pure Sunburst Yellow. Paint the Dragons teeth with skull white. Paint the nails on the backside with a metal colour (I used Chaimail). Before the superglue dries, apply gravel to the entire base. I would normally paint the sand on the base, but the GW gravel looks great on its own. Paint diluted PVA-Glue on to the base. Dip the entire base into static grass. Pull it out and shake the excess grass off. Look at your finished miniature with pride from many different angles – this part is quite important!